At times an HR manager faces a situation when he has to issue a warning letter to an employee whose performance is not satisfactory. Many reasons could become the root to send the said employee a warning letter. Absenteeism is one of the major and common reasons. No company tolerates a person for long who lacks in professional values which are near to impossible to withstand. This sort of person becomes a threat to the company and there is a great possibility that other employees can forsake being regular resulting in annihilating the morale of the company. So, a warning letter becomes mandatory in such a situation to keep the things from being messed up. Another reason behind receiving a warning letter could be the habit of lateness. It affects the ethics of the company the same way as does absenteeism. If the staff of a company manages to follow a punctual routine, then a single person with low ethical values can endanger the polished routine of the company. In such circumstances, the HR manager is on right to issue a warning letter to that person as a last chance provided by the company to mend his routine. Another reason behind meeting such a bad luck is mostly the non-serious and imprudent attitude of an employee. If such a person becomes a part of an organization, his disastrous ways can affect the already present teamwork in the worst way. Most of the companies deal in projects by assigning them to different teams consisted of their breadwinners. If taken easy, irrelevant material or late submission as a person or even as a team can create real chaos for the company. Consequently, a warning letter works wonders in such a situation. 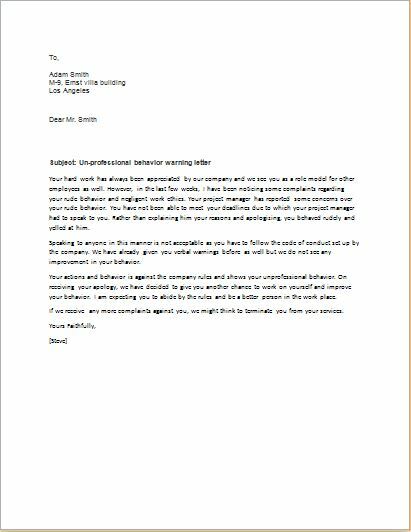 The HR manager doesn’t have to deal with the stubborn and arguing beings himself while a warning letter does it all the best way. No organization wants an employee with any of the above-narrated flaws. Anyone who is about to enter into professional life out there should have to have the knowledge about all these irritating behavioral flaws as these can lead them to an embarrassing situation to fight in near future.